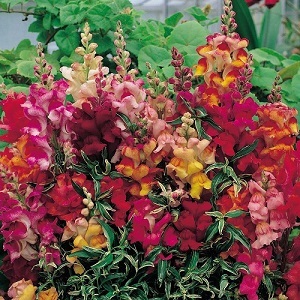 An attractive mix of Snapdragons, with unique variegated leaves and flowers in a bright range of colours. Plants grow to a height of 40-50cm and flower from May to the first frost. These are good border and pot plants. Snapdragons like full sun and moist well drained soil. Pack of approx 100 seeds. Sow in the spring, either indoors in early spring or directly in the ground or containers in late spring. Sowing instructions and a colour photo are printed on the packet. Conditions Grow in full sun and moist well-drained soil. Sow in spring. Sow indoors in early spring in a tray of seed compost. Do not cover and do not exclude light, which is needed for germination. Keep at 18-20°C and germination takes 1-2 weeks. Transplant seedlings into pots when they are big enough to handle, and plant outside after the last frost about 20cm apart, and after hardening off. Or sow in late spring outside directly into cultivated soil or into a basket or container. These are half-hardy plants, so make sure you protect them from frost. Deadhead the flowers to keep them in bloom. Remove the plants in autumn after they have flowered and they have died back.